Our High Performance Hosting plans have everything you need for your project, shop or ideas. With us you will have the latest security and performance technologies in order to achieve the fastest loading time. It is created for shops which are ready online and they need a more specific outputs of speed, performance and localization. With that they improve their positioning and their user experience. The shop is the core of your business, but is not everything. This hosting is designed for those who want to create their own environment including multistores, blogs, ERPs or even integrated TPVs. You won't worry again for the space or the transfer, everything is included. Our dedicated server is designed for an eCommerce with a high load of traffic. With this server we are able to deploy any kind of configurations, multi IPs in a multistore, more than one SSL certificate in the same hosting, ERPs... A product with a high scalability. The main difference between the hosting plans is very clear. The Unique Hosting plan is only available for a domain and has only 7GB in the hard disk, in the other hand, the Multi Hosting plan is available for up to 3 domains and has 20GB in the hard disk. If you want, you can start hiring an Unique Hosting plan and if your necessities are increased, you can change into a Multi Hosting plan easily. All of our hosting plans have access to our panel control, which is called Baifox. Lorenzo Tejera, who is our sysadmin, developed Baifox from scratch. Lorenzo is an expertise who has been managing High Performance Linux servers for more than 15 years. Our servers are designed to get the most from PrestaShop, Magento or WordPress. We can host any kind of script without hesitation. 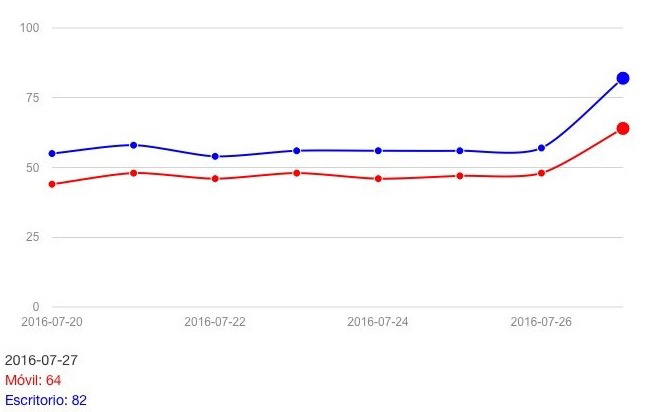 At the chart below you can see the difference between one of the most used hosting in Spain for PrestaShop and our Unique Hosting plan according to Google Page Speed. The previous host was given a 54/100 in desktops, and the first day in our Unique Hosting plan, without a change, scored 82/100 in desktops. If you have any doubts, we encourage you to visit some of our clients' websites. You will see how it performs. If you have your domains in the same company as your host, we can migrate them into esdominios.com, which is one of the few Registrar Agents approved by NIC.es. esdominios.com has one of the most competitive prices and one of the most secure systems.